Tony Redhouse is a Native American spiritual teacher and healer. He is also a yogi. At the age of six—adorned in a headdress, drum in hand, and bells on feet—Tony stepped onto a stage to represent his father’s culture. Since then he has danced and played music to share inspiration and wisdom from Native American teachings, such as the Eagle Dance, which speaks of finding balance, letting go, and fulfilling the circle of life. “From the eagle we learn that we have to leave our comfort zone in order to make the journey towards the truth of who we are, and towards peace,” says Tony. It is a journey that he himself has taken, but it has not been easy. Raised in the city, Tony says he found it difficult to make the adjustment from the Native America culture of his family to that of the society around him. By the time he was a teenager he was already dependent on alcohol and drugs, and, at the age of 14, Tony was admitted to a mental hospital and placed into foster care. For 36 more years Tony struggled with addiction and depression, costing him several marriages and a period in prison. “It took a long time, but I knew I had to change. There was always this inner voice calling me back to the truth, and finally I just surrendered to it completely,” says Tony. And things did change. Tony, now 59 and living in Arizona, works in rehabilitation centers helping those on the road to recovery. He also works in hospice—helping souls to transition at the end of their life— and with cancer patients—incorporating art, drumming, and music as a healing technique. Since kicking addiction and entering recovery, Tony has recorded five solo albums of Native American healing music, and has worked with kundalini teachers and musicians, Snatam Kaur and Dev Suroop. “It is realizing this harmony with all of life and the universe that in Native American culture we believe to be our purpose—for our hearts to beat in unison with the heart that beats in every bird, every rock, every tree, every animal, and every star,” Tony says. 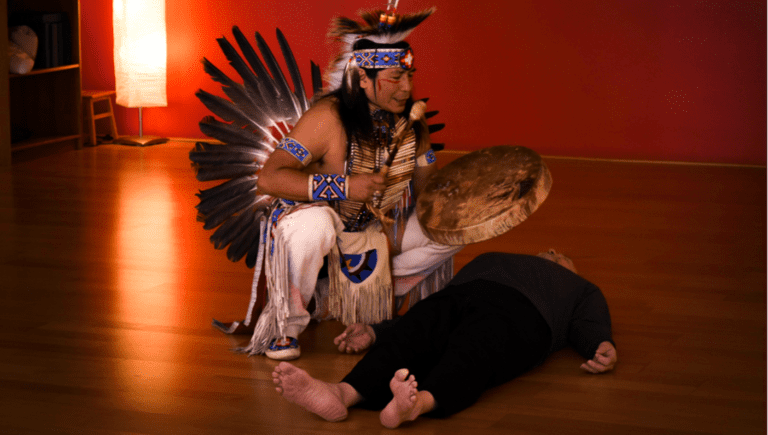 Now a yoga teacher, Tony has created a Native American spirit and yoga class to bring the wisdom of the two traditions together. He guides his classes through the Four Directions, and the circle of life, starting with birth and blessing in the east, and ending with the surrender of savasana in the north: “The place of the ancestors,” he says. Using hoops, he demonstrates the interconnectedness of all life, while the drum is sounded to connect to the universal heart beat. Tony kindly shared with us his teachings which draw from these two paths. Drumming in savasana. Photo by Kollin Lockamy. This personal balance is desperately needed, says Tony, as society becomes ever more disconnected from ancient traditions. “Humanity used to reach out to one another. We were open to learn from each other’s differences—seeking peace and harmony—but this is sadly no longer the case. We have forgotten that we are all one,” he says. Tony believes that even our spiritual teachings (such as Native American traditions, yoga, or Buddhism) are simply separate unique facets of what he calls ‘the diamond in the sky,’ or unconditional love.